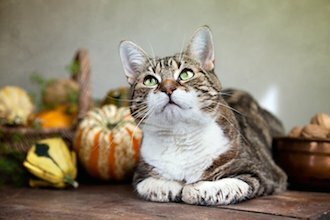 While it is tempting to prepare a plate complete with turkey and the trimmings for our pets, the New Jersey Veterinary Medical Association (NJVMA) cautions that fatty foods such as turkey skin can upset the digestive system and potentially trigger pancreatitis. This condition causes the pancreas to release digestive enzymes into the body cavity, causing possibly life-threatening abdominal (belly) inflammation. Your dog or cat may become listless, refuse to eat and drink, vomit severely, and have a tense, painful abdomen. Prompt veterinary treatment is needed to support your pet through this crisis. Less dangerous, yet still uncomfortable, gastroenteritis may follow any change in diet or overindulgence during the Thanksgiving feast. With tasty morsels at every turn, even the most well-behaved pet may be tempted to steal food from the kitchen counter or rummage through the garbage can. To help prevent these situations, try to keep food pushed toward the back of the counter and keep trash cans either secured with a tightly fitting lid or under a kitchen cabinet or in a closet. Should your pet, especially a dog, find its way into a pile of discarded turkey bones or left-over stuffing, call on your veterinarian to help manage your pet's malady. Swallowing bones can cause problems ranging from intestinal blockage or puncture (necessitating emergency medical intervention) to bellyache and constipation from slow moving bone chips. Should you notice listlessness, severe vomiting, diarrhea, or abdominal distention, contact your family veterinarian immediately. Remember, your family veterinarian is your complete source of medical knowledge and guidance for all of your pet's health care and behavioral needs. Rather than preparing a traditional Thanksgiving dinner plate for your animals, members of the NJVMA advise feeding either pet treats or a small additional serving of the usual diet during the family meal. Use caution in switching your pet's food or introducing new foods in that sudden changes in diet may trigger diarrhea. If your dog or cat is currently overweight, it is wise to contact your family veterinarian to discuss an appropriate weight management program for your pet. SO REMEMBER, IT IS POSSIBLE FOR THE ENTIRE FAMILY, INCLUDING YOUR PETS, TO SAFELY PARTICIPATE IN THE THANKSGIVING FEAST!